Andrew Marr's guests include John McDonnell MP, Dr Liam Fox MP, David Davis and Lord Sacks. Jo Coburn, Julia Hartley-Brewer and Faiza Shaheen review the papers. Interviews with key newsmakers and cultural figures, and a look at what is happening in the world. Guests include shadow chancellor John McDonnell MP, international trade secretary Dr Liam Fox MP, former Brexit secretary David Davis and the UKs former chief rabbi, Lord Sacks. BBC Politics Live presenter Jo Coburn, talkRadio presenter Julia Hartley-Brewer and the director of the think tank Class, Faiza Shaheen, review the papers. Plus music from Bennett Wilson Poole. 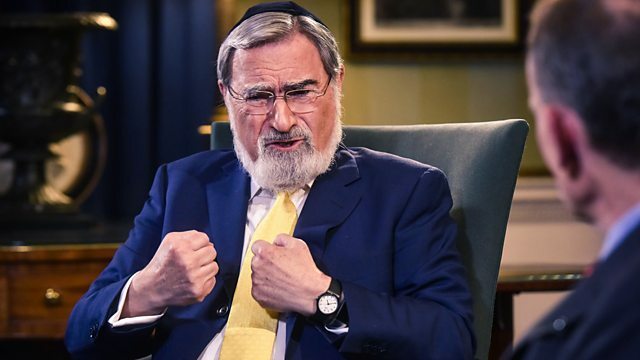 Jonathan Sacks: Corbyn must "recant and repent"